Hardy Sullivan, VP Market Development, Crypton Inc. The RISE® Innovation Award will recognize innovation in areas within and on the periphery of the nonwovens industry which utilizes advanced science and engineering principles to develop unique or intricate solutions to problems. 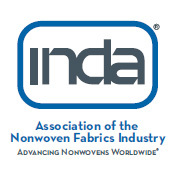 Areas for consideration may include: raw material advances, advances in process or manufacturing technologies including web forming and converting, new product or application development, or other areas that may extend or enhance the use of nonwovens. Join the finalists as they present their innovations to RISE attendees. The winner will be announced Thursday afternoon. PurPod100™ (www.purpod100.com) is the world's first certified 100% compostable pod for the Keurig single serve coffee format. Proven to break down in large-scale composting, the pod's mesh filter is a polylactic acid-based product. It is the first successful thermoformable PLA nonwoven filter application and its filtering delivers consumer satisfaction for many coffee brands. The new product, Madaline®, fills the gap in nonwoven technologies to be used in textiles applications. Madaline is destined to be a trendsetter, which can be treated like a traditional textile. In addition to its similarity to woven fabrics, Madaline's advanced attributes make it uniquely applicable for use in processes such as finishing, dyeing, printing, cutting and stitching just like traditional textiles. Madaline's microfilaments are up to 100 times thinner than a human hair and are the key to Madaline's unique properties. Madaline® microfilament fabrics are long-lasting materials that help to reduce the impact of waste on our environment. No binders, solvents or PVC are used in the manufacture of Madaline®. Madaline is washable and has very good and complementary properties of thermal insulation, wind resistance and UV protection. Madaline has inherent barrier against bacteria, (94.5% prevents penetration) and against dust mites. Mogul's new microfilament product, Madaline, will use state of the art bi-component technology to produce a soft, smooth and scratch and lint free fabrıc. The patented process will subject unique filament structures to high pressure water jets to simultaneously fibrillate and hydro-entangle and consolidate the microfilaments into the fabric. Madaline's dense structure will provide very good barrier and filtration properties. And thanks to microfilaments it is very absorbent, but quick to dry, breathable (good moisture management) and washable. It also exhibits very good thermal insulation, wind resistance and UV protection. Madaline's properties make it uniquely applicable for processes such as finishing, dyeing, printing, cutting and stitching just like any traditional textile. Expanded capabilities for this fabric include filtration applications. Revolution Fibres have developed Xantu.Layr®, the world's first commercially available nanofibre interleaving veil for use in carbon fibre reinforced composite materials. Produced using a proprietary production method (Sonic Electrospinning Technology), Xantu.Layr® is a non-woven web consisting of kilometre long thermoplastic nanofibers, each one being about 500x thinner than a human hair. Composite materials, especially carbon fibre reinforced polymers (CFRP's), are increasingly becoming the materials of choice in weight-critical structural components due to their high specific strength and stiffness. Despite these attributes, composites generally suffer from poor impact resistance, poor fracture toughness and poor delamination strength, particularly when brittle thermosetting epoxy resins are used. Significant advancements have recently been made by using nanofibre interleaving veils to increase the impact strength, delamination resistance and fatigue life of composites, and Revolution Fibres has recently launched Xantu.Layr® AP 4.5gsm, which is their highest performance veil to date. When placed in-between every layer of carbon fibre, Xantu.Layr® has been shown to improve the fracture toughness (delamination resistance), compression after impact strength (damage tolerance) and fatigue resistance of composite laminates. The Xantu.Layr® nanofibre veils acts as nano-scale reinforcements of the brittle matrix resin, resulting in a tougher resin (even when used with already toughened resin systems) which is less prone to micro-cracking when stressed or impacted. Xantu.Layr® interleaved composites have shown improvements of 173% and 69% for Mode I and Mode II interlaminar fracture toughness (ILFT), respectively, improvements of 12% for interlaminar shear strength (ILSS), and improvements of up to 21% for compression after impact (CAI) strength, all with negligible composite weight and thickness increases. Xantu.Layr® has also been shown to be particularly effective in reducing the effects of fatigue (repetitive loadings), and improvements in fatigue life of up to 400% have been seen in some composites. The ability to improve the inherent weaknesses of composite materials using Xantu.Layr® presents an opportunity for composite components to be used in applications that were previously not possible. Xantu.Layr® is particularly suitable for improving the performance of composite structures that are prone to impact damage, delamination, and high flexure or fatigue loadings. Moderator: Pierre Grondin, Corporate R&D, Berry Global Group, Inc.
Moderator: Jeffrey Bassett, Managing Director, Fi-Tech Inc.
Economic Outlook: Are We Stuck With Slow Growth? Christopher Nelson, Sales Engineer, Curt G. Joa, Inc.
Steve Bellavia, Business Unit Director - Nonwovens, Herrmann Ultrasonics, Inc. The RISE® program is subject to change. The opinions expressed during the conference are those of the speakers and not necessarily that of INDA or its Board of Directors.